Woods Powr Grip's Powr-Grip mounting cups provide a reliable, temporary fastener on almost any smooth, nonporous surface, such as metal or glass. Used to mount cameras, scopes and camcorders with standard 1/4-20 thread. Mounting cups employ a threaded stud, female insert or tie-down bail to fasten accessories and equipment to the cup. Woods Powr Grip &apos;s Powr-Grip mounting cups provide a reliable, temporary fastener on almost any smooth, nonporous surface, such as metal or glass. Used to mount cameras, scopes and camcorders with standard 1/4-20 thread. Mounting cups employ a threaded stud, female insert or tie-down bail to fasten accessories and equipment to the cup. They attach to either flat or curved surfaces, including filing cabinets, desks, automobiles, boats and recreational vehicles. Since mounting cups attach and release in seconds, they can be moved quickly from one place to another, without damaging most surfaces. 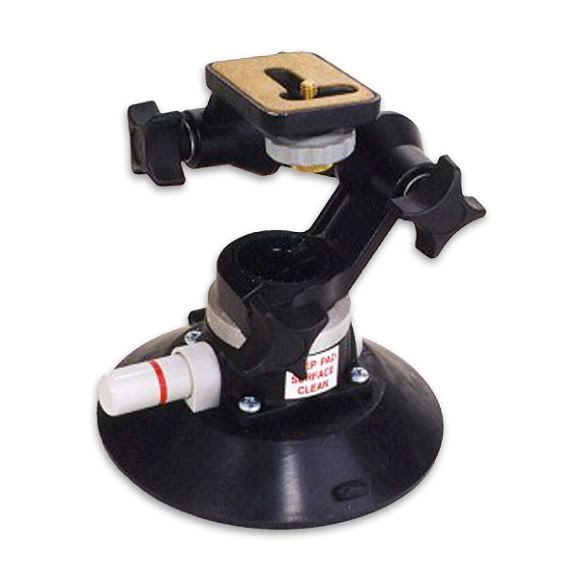 Black, aluminum accessory mount with fully adjustable pan-and-tilt head. Mounts cameras, scopes and camcorders with standard 1/4-20 thread. Powr-Grip also offers a selection of vacuum cups equipped with camera mounting heads: The Cleat and Gripper have many features of a tripod, but are designed for people on the go! Mount them on autos, RV&apos;s, boats, windows or counter tops. Knobs on the head provide infinite positioning and control for tilting and panning cameras, scopes and camcorders.